Photo of Sarah Orne JewettSource: photograph by James Notman in Pickard, Life and Letters of John Greenleaf Whittier. 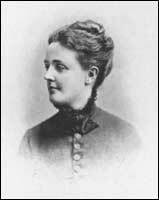 Looking back upon her brief friendship with Sarah Orne Jewett - to whom she dedicated O Pioneers! - Willa Cather wrote in "Miss Jewett" that she seemed a "lady in the old sense." "There was an ease, a graciousness, a light touch in conversation, a delicate unobtrusive wit. You quickly recognized that her gift with the pen was one of many charming personal attributes." Cather goes on to characterize Jewett's attachment to her town that was so visible in the last months of her life: "When she was at home, in South Berwick, there were the old friends of her childhood to whom she must always be accessible ... Every day, in every season of the year, she enjoyed the beautiful country in which she had the good fortune to be born. Her love of the Maine country and seacoast was the supreme happiness of her life" (Not Under Forty). Cather visited Jewett at her home in November of 1908, half a year before Jewett's death in 1909, seeing the house much as it can be seen today at its busy corner of Portland / Rte 4 and Main / Rte. 236. When Cather was preparing her 1925 edition of selected Jewett works, she visited Jewett's sister, Mary, and it is likely she stopped in South Berwick several other times after 1908. The Jewett House (5 Portland St., Map) is open Wednesday through Sunday (beginning June 1), guided tours only, 11:00 a.m. - 4:00 p.m. beginning on the hour - Admission $5; free to members of the Society for the Preservation of New England Antiquities (SPNEA). Before June 1, tours can be arranged by contacting SPNEA - jewetthouse@spnea.org. Parking on the street and in the Post Office lot behind the house (off Main). The house is full of interest, including painted china by Celia Thaxter, and decorative elements reflecting the Colonial Revival and Arts and Crafts movements. For more information see the SPNEA webpage. South Berwick Public Library, which was Jewett's home until 1887. It stands next to the Jewett house. Though it is now a public building, one still can see many of the decorative and architectural features of Jewett's home during her childhood and much of her professional career. 37 Portland St. ( map) Hours: MW 1-8, TTh 10-5, F 1-5, Sat. 9-1. Jewett's grave at the Portland Street Cemetery -- Left of Agamenticus Rd., off Portland St. / Rte. 4 ( map); in about the middle of the cemetery, the family plot with mostly horizontal tombs is fenced off & bordered by lilacs at the back. Photo and inscriptions. Hamilton House (SPNEA) - 40 Vaughan's Lane (southeast side of village, map); open Wednesday through Sunday (beginning June 1), guided tours only, 11:00 a.m. - 4:00 p.m. beginning on the hour - Admission $5; free to SPNEA members; grounds open free, sunrise to sunset. The setting for several Jewett sketches and, especially, The Tory Lover (1901); an elegant colonial mansion with Colonial Revival revisions. Fogg Memorial Building at the Berwick Academy, at 31 Academy Street ( map); turn eastward from Rte. 4/236 at First Parish Federated Church. While the whole building is of interest, be sure to go to the teacher's lounge (west wing) to view the many Sarah Wyman Whitman stained-glass windows, commissioned with Jewett's help. Jewett's own commission, the War Veterans Memorial window is in a 2nd floor classroom, south side. Call Berwick Academy at (207) 384-2164 to arrange a visit; if you arrive spontaneously, it would be polite to introduce yourself and purpose to an adult in this private school building. Visitors are welcome! Fogarty's Restaurant & Bakery on Lower Main Street. (closed Mondays). Terry recommends the chowder with home-made bread.